Over the next week, we at IDA will be introducing our community to the filmmakers whose work is represented in the DocuWeeksTM Theatrical Documentary Showcase, which runs through September 1 in New York City and through September 8 in Los Angeles. We asked the filmmakers to share the stories behind their films--the inspirations, the challenges and obstacles, the goals and objectives, the reactions to their films so far. So, to continue this series of conversations, here is Trisha Ziff, director/producer/writer of The Mexican Suitcase. 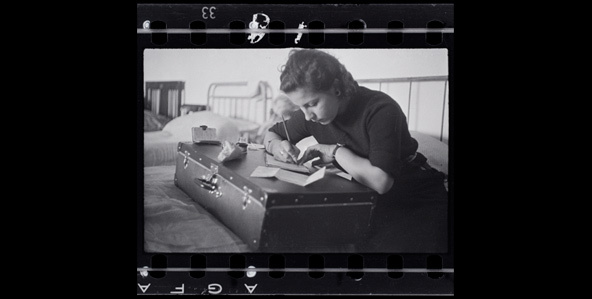 Synopsis: The Mexican Suitcase tells the story of the recovery of 4,500 negatives taken by photographers Robert Capa, Gerda Taro and David Seymour during the Spanish Civil War. The film follows the journey of these negatives to Mexico--images as exiles, recovered 70 years later. The Mexican Suitcase brings together three narratives: the suitcase, the exile story and how people in Spain today address their own past, 30 years after transition. The Mexican Suitcase addresses the power of memory, and asks, Who owns our histories? Trisha Ziff: I come from a world of photography. I have worked with photographers for over 25 years now, first teaching community workshops in the north of Ireland during The Troubles, then running an agency of photojournalists in London. I believe that documentary filmmakers and photographers think in similar ways: We tell stories and have the same passions and commitments. Of course, now as technologies change, photographers are becoming filmmakers. Look at Restrepo: It was made by a journalist and a photographer. an exhibition and a book. I had always worked with photographers, but I was never hands-on. I regretted that, so now I have a chance to shape ideas through film; it's the most exciting step I have taken. IDA: What inspired you to make The Mexican Suitcase? TZ: So many things inspired me to make this film. First, I finally got the rights to make the film, primarily because I had been pivotal in the return of the negatives to their respective estates in New York. I had grown up in England, in a liberal family, and I met so many people who had fought in Spain in their youth, in the international brigades. I heard their stories and I always imagined that had I been born in that era, I would have gone to Spain. 1936, and left with his family as a baby and found safe haven, as so many others did, in Mexico. So telling the story of the suitcase is also very personal. It is the story of exile, which is part of my son's heritage. In fact, Julio traveled with me to New York to return the suitcase to the estates. I thought it was important. Our narratives matter, and making this film for me was an incredible opportunity to bring all these elements together. TZ: Every film has its challenges! For me it was how to braid together these three narratives: the story of the suitcase and the photographers, which is, of course, a film in and of itself; the story of the exile from Spain to Mexico; and the story of how Spain today looks at and understands and addresses its own past. Convincing the Spanish investors about the stories of the exile and of contemporary Spain was not so simple. People wanted to see what was in the suitcase. I felt that was not enough. I wanted to make a film that asked questions and addressed notions of responsibility towards our past. If all you got were the images and the story of the photographers, it would be too simple and it would avoid the issues in Spain, which continue to be controversial. But for an outsider to broach these questions is very complicated. Finding a way to make that work was hard. I overcame all this by working with amazing people: my editors, Luis Lopez and Paloma Carillo, and my producer, Eamon O'Farrill, challenged me in their specific and very different ways. I have a very strong support group. In addition, the archeologists were key to the film and of incredible importance to the narrative. TZ: I remember the exact conversation and location when I realized in pre-production that I had to tell a story that was more complicated than just the journey and content of the suitcase. A conversation on a plane with a Catalan friend, Mar Verdura, shifted my focus away from the literal suitcase to the narratives of uncovering the past going on in Spain as a result of the Law of Memory being passed, giving the Spanish people the right to look at their own narratives--literally to dig for their own answers. I immediately saw the parallel of digging in the earth for answers and holding these old negatives to the light and giving them light again. I knew then the film I had to make. complexities of exile--emerged early on. The challenge was how to make it all come together in 90 minutes! IDA: As you've screened The Mexican Suitcase-whether on the festival circuit, or in screening rooms, or in living rooms-how have audiences reacted to the film? What has been most surprising or unexpected about their reactions? TZ: I was at the gala premiere of the film last month at the Rencontres D'Arles in the South of France. It was screened in a Roman amphitheater to 2,600 people. I remember looking around from where I was and seeing all these people absorbed afterwards in the street; people came up to me and some even wept, thanking me for telling their narratives. It was extraordinary. country in Europe that had 30 years of fascism. These things don't disappear overnight, and people have vested interests in both revealing the past and covering it up. This film is not neutral. How can it be? The photographers were not neutral either. I guess I am surprised by the strength of people's reactions. Clearly the film has an impact. TZ: Errol Morris. The way he interviews people is for me inspirational. I guess he is the master. And Werner Herzog. Both those men are inspiring! screening August 26 through September 1 at the IFC Center in New York and September 2 through 8 at the Laemmle Sunset 5 in Los Angeles. To purchase tickets for The Mexican Suitcase in New York, click here. To purchase tickets for The Mexican Suitcase in Los Angeles, click here.